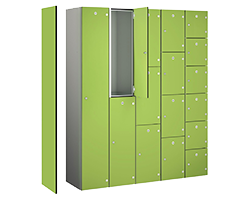 The Aluminium locker range is the ulitmate in quality and the standard of this product is just exceptional. Made from the highest quality components they are built to with stand wet and humid environments for many years. There is a choice of colours and also woodgrain effect finished we can be made to special order. If you are looking for a premium locker then this is the range for you.